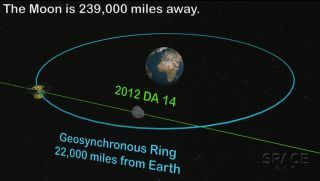 This graphic is an illustration of how the asteroid 2012 DA14 will fly between Earth and the constellation of geosynchronous satellites on Feb. 15, 2013, when the asteroid flies within 17,200 miles of the planet. UPDATE: Scroll down for the last asteroid 2012 DA14 webcast of the day, a 12 a.m. EST (0500 GMT) presentation by the Slooh Space Camera. When the asteroid 2012 DA14 gives Earth a close shave on Friday (Feb. 15), it will be a record-setting close encounter with a space rock of its size and you can track the flyby live online. The asteroid was discovered in 2012 and its Friday flyby is the closest of an object its size ever seen, NASA scientists say. NASA and several professional and amateur stargazing groups will offer live webcasts of the asteroid 2012 DA14 flyby, which will be at its nearest to Earth at 2:24 p.m. EST (1924 GMT). The asteroid is 150 feet (45 meters) wide, about half the size of a football field, and will approach within 17,200 miles (27,000 kilometers) —closer than the planet's ring of geosynchronous satellites —when it flies by. NASA will provide a 30-minute webcast on its NASA TV channel beginning at 12 p.m. EST (1700 GMT/9 a.m. PST) to offer live commentary during asteroid 2012 DA14's flyby. The webcast will be provided in the window above. This NASA diagram depicts the passage of asteroid 2012 DA14 through the Earth-moon system on Feb. 15, 2013. "The half-hour broadcast from NASA's Jet Propulsion Laboratory in Pasadena, Calif., will incorporate real-time animation to show the location of the asteroid in relation to Earth, along with live or near real-time views of the asteroid from observatories in Australia, weather permitting," NASA officials said. You can also access the webcast live via the NASA TV webcast page and the JPL Ustream webcast page. The Planetary Society will host its own webcast from 2:15 to 3 p.m. EST (1915 to 2000 GMT/11:15 a.m. to 12 p.m. PST) to chronicle the Friday flyby of asteroid 2012 DA14. The webcast will include live asteroid views from NASA, a video tour of La Sagra Observatory in Spain (where the asteroid was discovered in February 2012 using a Planetary Society camera), a live conversation with 2012 DA14 co-discoverer Jaime Nomen (if available), and a potential "surprise guest," Society officials said. Planetary Society director of projects Bruce Betts will host the webcast along with Planetary Radio host Mat Kaplan. "It may be the biggest show in space this year," Society officials said. The Bareket Observatory in Israel will providing at de a free live webcast of the 2012 DA14 asteroid flyby on Friday from at 2 p.m. to 3:30 p.m. EST (1900 to 2039 GMT). "The flyby will provide a unique opportunity for researchers to study a near-Earth object up close. The observatory will offer a special Live view of the close approach, using a remote telescope coupled with a cooled CCD camera, accessible via the Internet," observatory officials said in an announcement. If possible, the webcast will be embedded here. You can also follow the event live at the Bareket Observatory's 2012 DA14 webcast page. Amateur astronomer Gianluca Masi, who leads the Virtual Telescope Project, will provide live views of asteroid 2012 DA14 from Ceccano, Italy, beginning at 5 p.m. EST (2200 GMT). "We have been contacted by a lot of people for this show and all suggests it will be a memorable event!" Masi told SPACE.com. "I'm impressed to see how asteroids never fail to grasp people imagination. Of course, this is a close encounter, but we must admit that the asteroids never fail to get such attention!" You can watch the webcast in the window above or directly from the Virtual Telescope Project asteroid 2012 DA14 flyby page. In addition to the live commentary on NASA TV, the space agency will also provide near real-time images of asteroid 2012 DA14 before and after closest approach via a telescope at the Marshall Space Flight Center in Huntsville, Ala. The webcast will begin at 9 p.m. EST (0200 Feb. 16 GMT/6 p.m. PST) and last three hours. It will be visible in the window above. You can also follow it directly at the Marshall Space Flight Center Ustream webcast page. The online Slooh Space Camera stargazing website will hold several free online webcasts on Friday to chronicle asteroid 2012 DA14's flyby, beginning at 9 p.m. EST (0200 Feb. 16 GMT). The webcasts will feature real-time commentary by Slooh Space Camera's Paul Cox, astronomer Bob Berman of Astronomy Magazine, and Matt Francis, the manager of Prescott Observatory at Embry-Riddle University in Arizona. Graphic depicts the trajectory of asteroid 2012 DA14 on Feb 15, 2013. In this view, we are looking down from above Earth's north pole. The Slooh webcasts will provide views of asteroid 2012 DA14 from observatories in the Canary Islands, off the west coast of Africa, and in Arizona. They will also be viewable on iOS and Android mobile devices. You can watch the Slooh webcast in the window at show time, or directly from the Slooh Space Camera website. SPACE.com is providing complete coverage of asteroid 2012 DA14's flyby. Visit SPACE.com on Friday (Feb. 15) for day-long coverage as the asteroid buzzes Earth.